Last month we touched on release, compassion, and forgiveness, and this month, we celebrate our connection with the Wheel of the Year, Earth, and each other. The Sun is one of the reasons we exist here on Earth. Our ancestors worshiped the Sun, as it is a life-giving force and represents co-creation. Our connection with the Sun represents our interdependence. As I shared in our Sabbatical class last month – I wish we had an interdependence day. We rely on one other, helping each other. For the Sun giving us life, again and again, and our gathering of its energy, creates an unbreakable dependence. All things – living and nonliving – are made of the same matter that make up the Earth. We have an interdependence beyond our control and there is something sublimely beautiful about this. The symbiotic nature of living and nonliving things is basic, and makes it absolutely mandatory that each of us belong to something. Even when we feel as though we’re alone, our genetic makeup contradicts that fear. Our survival depends on our connection, our trust, and our communication with one another. One doesn’t exist without the other. Our ancestors understood the sacred importance of deep connection between people, animals, and nature. Neglecting our interdependence, or interconnectedness, with the Earth, or each other, is to neglect ourselves. We have a very limited number of these sets available for purchase; each comes with a beautiful river rock tea light holder (about 3×5″), custom engraved with the power word of the month (this month, Connect); a limited edition Connect perfume made with neroli, rose de mai, sage, and a garnet chip stone, known for its utilization of creative energy. Next, a gemstone set including angel aura quartz, scolecite, angelite, natural fuchsite, and a small blue chalcedony; a set of four blue soy tea lights scented with my Connect perfume; AND a 5×7″ art piece, custom made at Sage Goddess with a power mantra. I am also throwing in a bonus pack of Divine Incense – A favorite here at Sage Goddess! At the end of the year, you will have a gorgeous set of river rock tea light holders to place as a path in your garden or sacred space, spelling out the action steps you took this year to honor your power and sovereignty. You are invited to make a ritual out of lighting these candles, a constant reminder of your soul’s development this year. 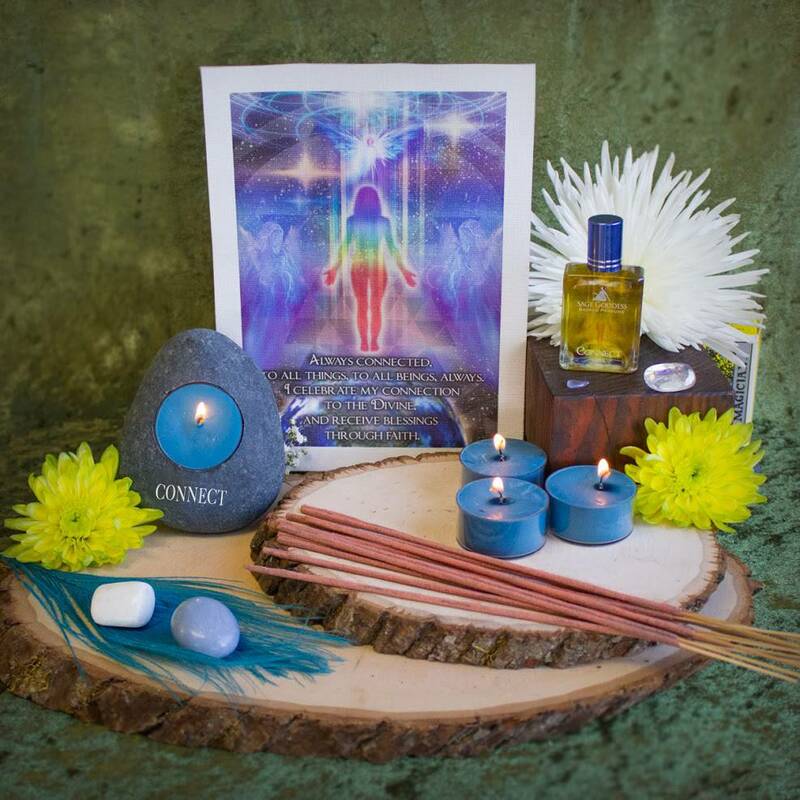 By purchasing this kit, you are calling in the energies of the kit – even before you receive it! Note: This product is made with natural essential and carrier oils, and may contain fragrance oils. Cap color, chip stone, and color may vary slightly. For external use only. Please always use a heat proof dish on a stable surface for your tea lights, and never leave a burning candle unattended. This listing is for one (1) Sabbatical Kit, or you may choose your individual tools from the drop down menu. Yours will come lovingly parceled for your enjoyment and delight. May you be blessed with all that you seek; may it arrive in perfect time. So it is.